Special Orders: Required Selection...Merle B.Austin R.
Contact Us to let us know what you'd like. Once your button design is completed, we'll email you a sample of the artwork to approve and let you know when your button is ready to order. Then just come back here and select your button from the Special Orders drop down list above. Add to Cart and simply continue shopping or checkout. It's that easy! 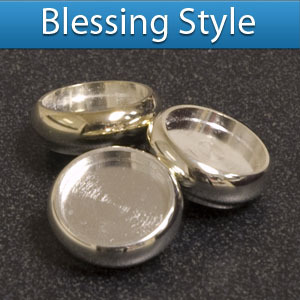 Special Order Accent Buttons are made to order - just for you! Even though the item may be listed In Stock, please allow at least 3-6 weeks for our artisans to design and craft your buttons. Accent Buttons are sold in sets of three (3). An additional button can be added using the "Additional Buttons" drop down menu located above. Custom Order buttons start at the price listed above. Requests that involve more complex work may require an additional charge. In such cases, you will be notified of any additional charges prior to work being done on your buttons. Please read our Returns & Trial policy concerning custom orders. From our years of experience in making these custom buttons we reccomend against using solid white backgrounds. The light tends to disfuse the other colors in the button, giving the background a slight hue. We reccoment getting creative with your color choices; stand out! Please be aware that because each horn is machined differently, we cannot guarentee how buttons will line up once they are screwed in properly. If you'd like to learn more about our Precision Placement service where we gather information on your instrument in order to have your buttons line up like you had envisioned, Contact Us. In addition, please be aware that all trademarked material will be subject to inquiry. If you are not the rightful owner of the trademark, we will be unable to make your button.